Whether or not I end up with an EV, the path so far has uncovered some very interesting vehicles. Also note that I seem to encounter a new EV company name nearly daily so the following list is far from comprehesive. Also, note that people are still not understanding the need to put the seats in a tandem configuration. I imagine the marketeers are saying "but SHE won't like sitting in back!" and I respond "SHE doesn't come with me to work!". The urge to build a electric car came from a solar-powered car seen in Mtn View. This simple car was built by Jerry Karmin, a resident of Mtn View who's very knowledgable about electric cars, solar, and related issues. Jerry uses old motorcycle parts to obtain direct drive. He occasionally removes the solar panel and drives it on the freeway. I was sad to learn that "solar" just isn't a real option for powering a car; it just doesn't charge nearly fast enough. IF you could point Jerry's solar panel right at the sun, it would produce 1/2 KW which would fully charge a typical battery pack in 20 hours. Jerry has 6 batteries (6volt?) on this trike. I don't know what its KWh rating would be. yep, this might be the winnah! This was designed and built by Jamieson DuRette in Maryland. He sells the plans for $75. He calls it "Indy Cycle"
I believe this design can be improved by putting fenders on front wheels as done in ElectroLite roadster a few windows below. Then mount the headlights and rear view mirrors on the fenders. Then put wing-like fairings on the horizontal extensions which attach to the front wheels. The rear end needs a much different shape, too. side view. sleek! It's currently powered by a Kawasaki motorcycle engine but he's considering an electric version also. 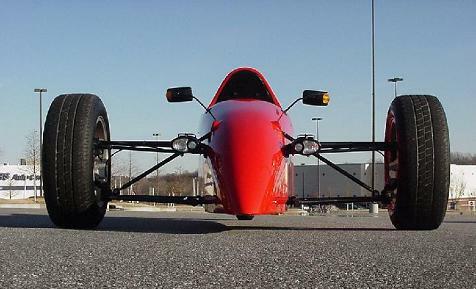 Mostly for aethetics, I think the rear wheel should be wide, like the one shown in the San Antonio trike below. In fact, the whole swing arm should be 'borrowed' from the San Antonio design. Shows the Aptera in side view. Now, THAT is good looking! Makes a person want to dive into the composite world (well, sort of...). Projected to cost $26,900 to $29,000. The coefficient of drag, Cd, for this car is only 0.11, a very low value. I believe it'll start shipping in early 2009. The company is accepting refundable $500 deposits to hold a place in line! Mark and I ran into one of these at the Golden West flyin in June 08. We were told that the gas version we were looking at had been made by a company in Ashland, OR, but that they had changed over to making electric bicycles (?). And later I ran into a You-Tube of an electric car like this, chassis 'Atom' (? ), blowing away a $400K Ferrari and a $170K Porsche. the "MIT car". Whoa! Someone's thinking out of the box! My hunch is that this is really an NEV; it doesn't look streamlined enough for a commute vehicle. Sparrow, made by Myer's Motors. Full name ends in "nmg" which likely means "No More Gas". This is a "Citicar", made in about 1975. It was being sold on EBay for $1650! It seems to be a 48v model which is said to be extremely weak. Still very interesting. This is a Norwegian "Think" which will sell in U.S. starting in 2009 for about the cost of a Prius. Seems to be limited to 50mph but looks like a good, tiny car. Has regenerative braking. Not very peppy. Range ("about 40 miles") depends on battery options. link. whoa! newest Think, called the "Ox", has a 0-60 time and a range over 120 miles! (article in Business Week(?)). They've figured out how to make each factory in the U.S. for $10 million and less than 1 year(?). It takes GM 4 years to convert a single assembly line to a new model. Doran plans-built 3-wheeler. FWD. Subaru parts. Rick Doran spent 6 years perfecting this car. The result got rave reviews from rqriley.com which is not connected to Gorilla , Rick's company. Rick is about to surrender the "gorilla" name and use "Doran Electric Vehicles"
The upcoming One Liter car by Volkswagen. Over 200 mpg on diesel. One Liter. view from above. narrow, sleek, small. The Dodge Zeo (concept vehicle). Chrysler is going soooo slowly on this. Doesn't look like it'll be ready by 2010.
chassis layout for the XR3. note how narrow the central battery mount is. XR3 foam shaped for glassing. Nissan Mixim. Note the covered wheels. good idea. Doors up. 2 seater? for the HOV lane? redTail. don't remember its real name..
car construction starts bolted to a very stiff 'reference frame'. not everything beautiful has an engine... It's called the "Dogsled Quad"